With broad beans currently in season and with them being one of my favourite recipes, I thought I'd reblog this, which is my take on an Italian classic. It is also one of my mother's favourite recipes. There is no better time to make it than now, with all the gorgeously fresh broad beans and peas still in their pods which are around at the moment. Of course, you can make it any time if you use frozen ones, but it's never nearly as nice. Place the olive oil into a saucepan over a medium heat. Add the onion, pancetta, oregano and chilli. Stir occasionally, until the onions are soft; this should take about 15 minutes. 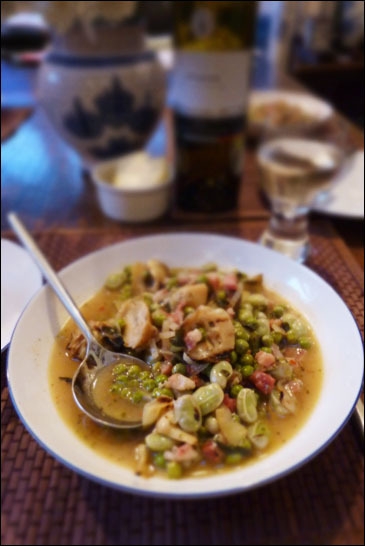 Season with salt and pepper and add the artichokes, peas, broad beans and garlic, and stir and cook for five minutes. Then add the wine and mint. Cover and cook over a medium heat until the vegetables are really soft – about 25 minutes. Taste and adjust seasoning if needed. Serve in soup bowls with lots of fresh ciabatta to mop up the juices. This looks so simple and lovely - such a delicious combination of flavours. I love broad beans and am always looking for new ways to cook with them so will definitely be trying this out!